Well - I arrived last Tuesday back in Adelaide - after about 24 hours of travelling from Sapporo. The trip back went pretty good (apart from the earthquake in the Qantas Club). The direct flight from Tokyo to Sapporo was actually surprisingly busy (certainly much busier than the flight in only 3 weeks earlier). Is this a sign things are returning... or a sign that still more people are leaving than coming? I don't know. When I arrived at Narita around 2pm, it was however like a ghost town. Very quiet. The weather in Sapporo when I left was pretty ordinary, and I thought it was fantastic weather here in Adelaide (mid to high 20's and fine). Perfect autumnal days in Australia all week. Until today. The rain has come, and autumn is reminding us that winter is just around the corner. Back in Sapporo, I had about a week or so to relax and recover (T-chan and L-kun stay on for another almost month after I return to cold old Adelaide). The weather in Sapporo in spring can be pretty hit and miss (mostly miss) with the snow turning dirty, and the weather turning wet (but still cold). 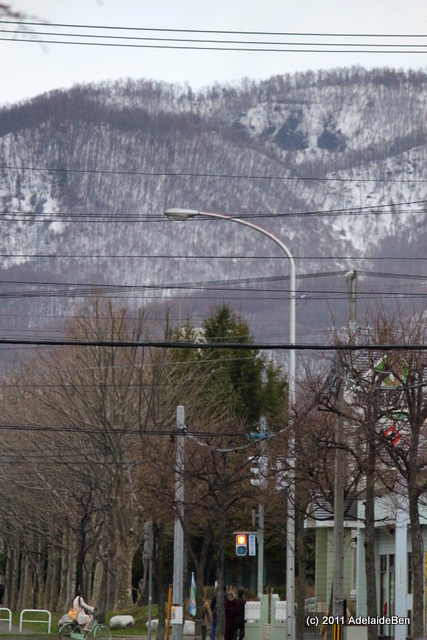 The snow in the mountains surrounding Sapporo is rapidly disappearing, with the signs of green very slowly appearing. Unlike in Australia where summer means brown, and winter green, it's the opposite here. Once the white blanket of snow starts to melt, it leaves a fairly desolate brown landscape as the vegetation slowly remembers summers warmth. For me, Sapporo also means family time, and for L-kun that means parks. 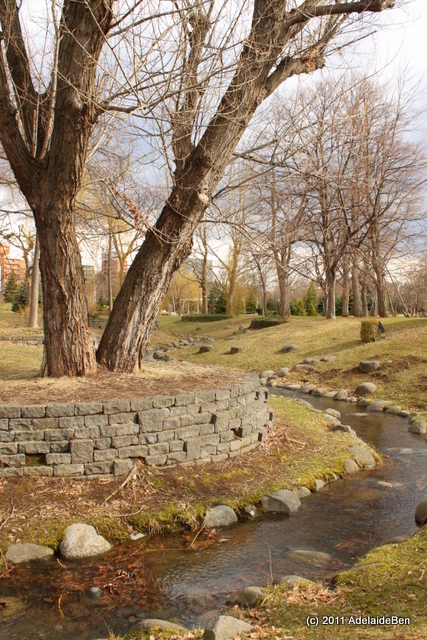 We had a look at a new garden park, Nakajima Kouen, in the city... which is one of Sapporo's date spots. At this time of year, it's pretty cold. And about the only dates that are going on are between couples that have seen quite a few springtimes themselves. There are however the first signs of a beautiful Sapporo spring appearing. 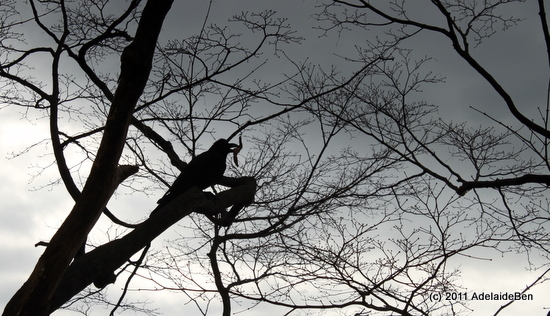 But the ominous vestiges of winter remain, and the ever present karasu (crow) lends an eerie punctuation to the landscape. Even though Sapporo is a big city (5th largest in Japan), it has been hit hard in recent years due to the slow economy... and with the recent events, times are getting tougher. There is a steady resilience to the people that is born from the cold depths of a Hokkaido winter. We went to Otaru on our way to Niseko... Otaru is the nearby tourist city that is especially popular with China and Korea. It's famous for it's canal system, it's glassworks and it's music boxes (and progresively for it's wine industry of all things). And whilst it would normally be thriving with tourists, today it was like a ghost town. The tourists have stopped coming, scared off by the tainted Japan brand perhaps, but whatever the reason it spells a hard spring ahead for the city that depends on tourism... even though it's so far away from Fukushima. Maybe a musical (belated) Christmas wish is for common sense to prevail, and for normality to be returned. In the 8 trips to Hokkaido that I've made, it might be surprising that I've never been to Niseko, or little Australia as it might be known. Come winter, the population is overwhelmed by Aussie skiiers. The season is still open in Niseko, though the snow quality (that is one of the reason for it's popularty) is well and truly gone. We stayed at the Prince Hotel in Hirafu (Niseko) which has the one advantage of having not only a large public onsen, but also private onsens in the hotel rooms. 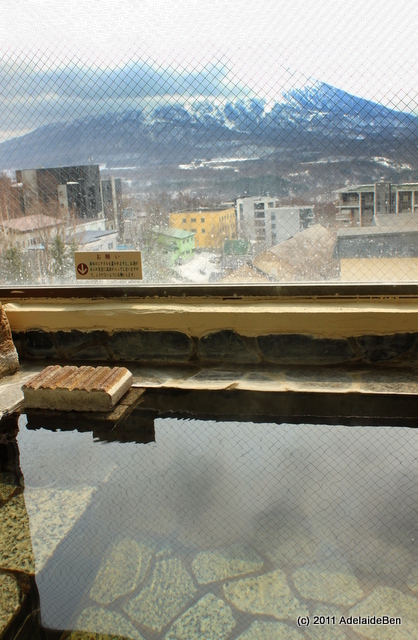 A great way for a family to enjoy an onsen together (and this was our son's first experience - and he loved it). The other advantage is some good views of Yotei, Hokkaido's Mt Fuji. Like Fuji, Yotei can be a little temperamental in showing itself... especially on a gloomy spring day. It's form however dominates the scenery for many 10's of km around. Whilst it's possible to climb Yotei, it's not actually a ski mountain itself, and perhaps it would take a brave person to attempt it's hazardous slopes. We were happy enough to be a little less adventurous, taking to our sled in the pretty wet snow. Whilst the quality might not be there, it's still a fun opportunity to enjoy the snow together with our family. Something that's not so easy in Adelaide. We were originally going to combine the trip to Niseko with a trip to the Shakotan Peninsula - however, a high temperature with L-kun put paid to that idea. Something for next time... when the weather is nicer. So as my days in Sapporo, and Japan, come to an end, I have to say that it's been a great trip - although it started in slightly stressful conditions. Despite the constant media attention on the negative, the great things about Japan are still there for the enjoying. I'll post more complete accounts on my other site as I get to them (I'm stilll posting about 2010, so it might take a while however). PS - it looks like Qantas have now resumed their normal (reduced?) flights to Japan... so I should be good to go tomorrow lunchtime departing from Sapporo to Tokyo to Sydney to Adelaide. A quick hint - we discovered the joys of taking an international connecting flight (QF81) from Sydney to Adelaide which means that you don't have to clear customs in the tragedy that is Sydney International Airport. In keeping with the idea of a tease of the trip, I've just thrown together a couple of the photos from Kyoto as well.... it was a quick 2.5 days (arriving at lunchtime on the 12th, and leaving mid morning on the 15th). Still, it was good to take some time out of Tokyo (even though we most probably didn't really need to). Still, it gave me my first shinkansen experience... and I got to see Kyoto in cherry blossom mode which I most probably wouldn't have done otherwise. One of the treats that we hadn't expected was the gardens of Heian Jingu, Shin'en, which we had missed last time around. The blooms were fewer, and the light starting to fail by the time we had arrived, but it was still a wonderful way to end the first half day in Kyoto. ﻿﻿﻿﻿ The second day started a little late (and slightly foot-sore)... we took the bus (a mistake) to Daitoku-ji in the north of the city... and had a look at some beautiful gardens. 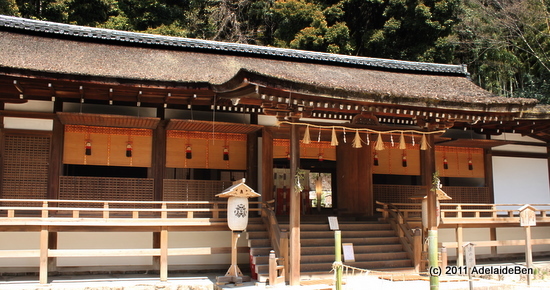 Daitoku-ji is also well known for it's links to the tea-ceremony, and the fabled (and ill-fated) tea master, Sen no Rikyū. The temple has quite a few rooms that were built by him specifically, some of which had quite an eerie feel to them, including this rather unique dark tea-room. There are also a good collection of gardens in the Daitoku-ji that are well worth visiting (my favourite was Koto-in) - though I have to say that the most famous, Daisen-in was also perhaps the most disappointing. We then walked through the northern foothills to get down to Hirano Jinja, via Kitano Tenmangu, one of the older shrines in the area which is well known for both it's flea market (25th of each month) and the mass tea ceremony hosted by geisha on the same day in February. Today was just an ordinary day - filled with school kids paying their respects at the shrine which is also associated with scholarly success. Hirano Jinja was a definite surprise highlight of our trip... beautiful sakura and a really nice vibe. Also had a great lunch sitting under the cherry blossoms. 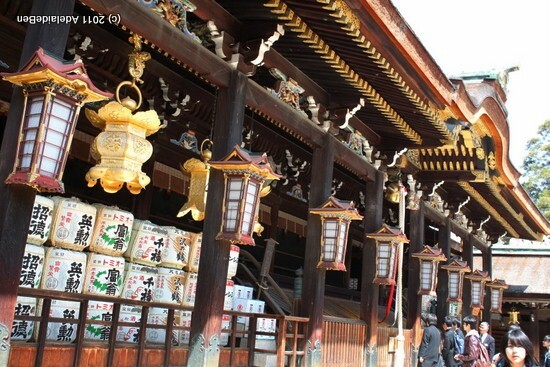 It's one of the original shrines from the commencement of the city of Kyoto, and is famous for it's cherry blossom festival. We then caught the Randen Railway (a great little secret we found) to Arashiyama in the northeast of Kyoto. The afternoon light in mid April is quite soft, and yet the evening wasn't too cold. This is a great date spot in Kyoto.... and the couples were out in force. And Arashiyama is also famous for it's bamboo forests which are quite magical as the sun sets. The only disappointment was that we elected to have dinner at Arashiyama (which basically becomes a ghost town in the evening... very strange given that it's peak tourist season, and Arashiyama is one of the focal points for cherry blossoms. I'm not sure if this is specific to this year, but it was quite stark and felt about as silent as the bamboo forests in the hills). The main focus for the evening was the illumination of the sakura in Nijo-jo... a beautiful location in Kyoto during the day, and also beautiful at night.﻿﻿﻿﻿ I'll show more in the proper posts. The next day (even more tired and footsore) we took a late train ﻿out to Uji, which strangely enough had been the original reason for coming back to Kyoto... we had planned a driving tour around Nagoya - Ise Peninsula and finishing up at Shiga/Hikone... and I had suggested visiting Uji on our trip as we'd missed it last time around. T-chan then asked - why not spend our mini-break in Kyoto, and it just clicked from there. We both really wanted to go for the driving holiday around Ise, but in the end, perhaps we were going to try to drive too much. Instead, we punished our feet in and around Kyoto. Byodo-in is one of the main attractions of Uji, and one of the focal points of bloody civil wars (or disturbances) between Genji and Heike clans that culminated the golden era of Japan known as the Heian period (794 - 1185 AD approx). The Pheonix Hall is orginal from 1054 AD, and as demonstrated by my beautiful assistant, also represented on each and every 10 yen coin (and 10,000 yen note). Uji is also a very nice place for sakura along the river bed.... and surprisingly few people... once more a sign of reduced tourism due to the fear of radiation from Fukushima Dai-ichi power station? Crossing the river, you come across Ujigami-Jinja... apparently the oldest extant Shinto Shrine in Japan, though originally built in 1060AD to provide is quite a nice spot to sit down for a few moments... and reflect on history of Kyoto, and how many centuries the city and the culture has existed through many calamities (both natural and man-made). This temple was built to protect Byodo-in - though itself is a fairly simple and understated shrine. We then caught a train/taxi to Daigo-ji which sits on the south eastern edge of Kyoto. The sakura had definitely passed their peak here, and yet it was a great opportunity to enjoy the fallen petals... like snow on the ground. The rest of the grounds were still quite beautiful, and there were still cherry blossoms to be found. The ended the night in Gion, almost completely deserted now... it was a very different experience to last time we were here. Yet it was a nice place to see without the tourists...oh... I forgot. We were tourists! Wereturned to Tokyo - nervous about the time we had left ourselves to get to Haneda Airport (given the delays that had happened on our way to Kyoto. However, in the end there were no dramas and we arrived in Sapporo on time - but much, much colder. We had left Kansai at 23 degrees, and tomorrow, we'd be lucky to scrape over 10 degrees. It's funny sometimes however, you take a photo and only afterwards realise you found something interesting... On our flight from Tokyo to Sapporo I snapped something that sort of captures my feelings for Japan. I know that times are tough now, but things will get better... and I do love visiting Japan. Now as much as ever. I won't try to replicate my other Japanese Ties blog... as this isn't my normal travel blog... but I thought I'd give some very quick impressions from my on-going trip to Japan. Firstly - this has been almost without doubt the most interesting, scary, stressful, beautiful, family oriented, happy, tiring and relaxing trip to date. And I've only just arrived in Sapporo. Tokyo has to a large extent returned to normal - with the exceptions of some limitations on the supply of large bottles of water (saw plenty of small bottles in convenience stores, but no big 1L+ bottles), lots of dimmed lights, lots of events that had been cancelled, a general sombre mood. And for those that say that there was no infrastructure damage in Tokyo - there was, but thankfully it was mostly limited to the reclaimed land areas around Tokyo Bay (especially to the east in Urayasu City), there are major problems... and I mean very difficult and expensive problems to fix. Buildings, roads, pipes etc are all damaged, and it must be a long slow process of rebuilding. Another lesson to learn post earthquake... the follies of reclaiming land on an earthquake prone landscape. ﻿﻿ And yes - there are still aftershocks hitting the country to the north-east which are being felt here in Tokyo. The worst one we felt was on the morning of the second day in Tokyo - around 6:30 in the morning... which felt like quite strong, rapid, violent shaking that lasted for what felt about 1-2 mins. Actually, it wasn't the worst of the earthquakes - they happened at the end of our stay in Tokyo, but we were oblivious to them (perhaps on the train or something). They rattled my parents-in-law who actually started to freak out (opening the room doors as they are taught to do in bad earthquakes to allow rapid evacuation). The second time we had set out on our way to the Shinkansen station, with what should have been plenty of time. But by the time we got to Musashi-Koyama, we found that the crowds were already milling, and the station staff started running around excitedly. Another earthquake just before had halted the trains again... and all of a sudden lots of time, looked like very little time...　and shinkansen wait for no man and/or woman. Catching a taxi (thankfully) to Shinegawa gave us the breathing space we thought we needed.... and I have to say, that I've suddenly become quite familiar and happy with taxi travel in Japan (we never used to do this) - but, it turns out to be much cheaper than in Australia, and all things considered, a lot easier than transferring lots of stations. In the end - it turned out that Shinkansen do wait for nature - at least in the guise of earthquakes. Another 20 min delay most probably meant we would have had enough time... but you can never tell. Now on to Kyoto - which I have to admit to loving to little temple bits. I am a nerd, as T-chan would say. Anyhow, I had expected (for some reason) for the sakura to be well and truly past their peak, but they were quite strong in many parts of the city, and it was such a pleasant surprise. The atmosphere in Kyoto was quite different... I won't go as far as to say indifferent to woes of Tokyo (as all of Japan suffers with the residents of Tohoku, whether they live there or not), but they have none of the infrastructure problems... although I still couldn't find the 1+L water bottles that I would normally have seen in convenience shops. Unlike in Tokyo, most events were continuing, and people seemed really to be able to relax with hanami (cherry blossom viewing) which is normally a national mania. I liked our time here, but we started walking from the moment the shinkansen pulled in (btw - my first shinkansen.... strangely enough) on tuesday morning and continued walking through to Friday morning. It was a hard time - a lot like our first trip to Kyoto 4.5 years earlier... Still, it's such a wonderful city that invites you in and has so much to offer. And this time, it had sakura in abundance. The one thing we hadn't planned for was the warm weather however... it was 22-23 degrees C here, which made for nice walking (if you have light clothes)... we had however planned for cooler weather. A quick stop at Uniqlo (my favourite cheap but good clothing store) helped out here. I would say that if you are going to Japan to spend most of your time in Tokyo, then you may be advised to delay slightly... not because of the risk - but because the mood is still subdued, there are still annoyances, and especially disruptions to the train services which are a central aspect to tourism in Tokyo. However, if you insist on travelling to Tokyo or Japan at this time, you can enjoy yourselves well, and can be confident on having a safe journey. Just leave plenty of time. The only footnote I add here is that T-chan's parents have told us that there are some predicting a mag 8 earthquake to occur somewhere in eastern Japan within as little as the next month. I don't mean to alarm you (especially after re-assuring you) - but the reality is that these are troubled times - and the earthquake/tsunami/nuclear reactor problems will be here for months, possibly years. Hi all - well, T-chan and I arrived safe and sound in Sapporo last night after a very very hectic, ejoyable, and quite a bit foot-sore 2.5 days in Kyoto. It was a great time to be in Kyoto, and nice not to have trains being cancelled due to earthquakes. Hopefully now I will be able to resume some semi-regular posting. Well finally, I'm at Adelaide Airport. But what a journey. I had the day off work (and was actually thinking of going to work today it was that busy), but it was a good thing I didn't. I haven't had a chance to relax. Even now as I sip from a beer in the Qantas Club in Adelaide Airport, I'm pretty juiced up on adrenalin. You would think that years of international travel would mean that everything goes like a well-oiled machine. However, complacency is ever comfort's enemy. I left too much to the last day, and it showed. Well - I'm here at least. The first leg of my journey to Japan - to be reunited with my wife. Thankfully my brother's house-sitting so that T-kun (our cat) won't be too lonely whilst we're away. What a day, what a week, what a month. Seriously - I've been running on about 5 hours sleep a night for the last week, and even last night it was a 1am sleep, 5:30 am wakeup. I don't know what sort of state I will be in when I finally arrive. See you all on the flip-side! PS - News from Japan is mixed at the moment, they've apparently managed to close up the leak (by just about every known technology known to humankind by the sounds of it), and yet at the same time they've just released 11,500 tonnes of radioactive water into the Pacific. I'm not sure how to reconcile those two things (is that a YEAH! or a Huh?). To make matters worse, they've detected high levels of radiation in some of the fish-life around that area. Hmmm.... sushi's looking a tad doubtful (at least until I get to Sapporo). PPS - you'd also have thought that I would have known not to have packed a wine bottle into my carry on luggage. I did know not to... but such was the mad dash to the taxi pick-up time, that many things (including common sense) went by the by. Today I Generated 12.66 kWh... Without Breaking A Sweat. Well, in recent times it's been a topic of some interest here in Adelaide (and Australia in general) - the cost of electricity. This is in the context of a move to a carbon-based tax reform that the government is trying to bring in. And of course - lets not forget the other energy debate that's currently going on - whether or not nuclear power is a solution. It is interesting to see the Japanese government has announced that there will be a greater emphasis on renewable energy and solar in particular. Well - this week we started doing our own bit (thanks to the inspiration and support from my parents, whom are strong advocates for solar power since they installed their own system a year ago). So we went with EnergyMatters, to get a 2.1kW system, expandable to 3kW. For us now, 2.1kW should pretty well make us energy self-sufficient (we have gas heating and cooking), but we're expecting energy growth as L-kun gets older. To be honest however, for bang for your buck, a 1.5kW system is definitely the most cost effective way to go with the current rebate system in Australia. The installation of the systems was in itself a very funny story. With T-chan already in Japan, I had to take a day off work to be here for the installation. Only to lock myself out of my house about 5 mins before the installers arrived. Embarrassing. Thankfully, the installers were fantastic and we had the problem solved in no time (I won't say how). Not only that, they also found that the previous owners had left a live wire up in the roof (they had moved a light, but failed to hook it up). So the guys installed a new light fitting and hooked up the wires for free. Great service that went well and truly beyond the call of duty. So here we are now... energy producers. And it does feel good. Ok -we're coming into winter, so I'm not going to get the most out of the system, but better late than never. Note - the government is reducing the rebate available to people for installing solar power (from July 11) which means it's unlikely you'll have time to get it installed in time with a huge back-order of panels and installations. However, don't despair natural competition will likely continue to bring the price down (they've dropped a lot in the year since my parents installed their system). The only thing worth considering is however - if Japan does get into Solar in a big way quickly, you can expect to see a huge draw on the global inventory of panels (Japan is a big supplier of panels itself). This increased demand might possibly cause a temporary increase in prices, and a lengthy shortage of panels in the worst case. Well, to update you on things, Qantas are still changing flight schedules around (they seem to be doing it on a weekly basis, making decisions on Fridays about the upcoming week). Not sure what happens if you're flying out on Saturday though. Anyhow - they put me on flight that left Sydney (direct flight for Narita) the next day at 6:05 am. Yet - in my opinion this is just an imaginary flight (they did the same thing to T-chan as well). So I jumped first before being pushed and changed my flight to also fly via Hong Kong (from Melbourne), and this time fly direct into Haneda airport (where T-chan/L-kun and grandparents would be arriving 30 mins earlier). That's a significant advantage. We're all together no matter what happens. The issue that we're working through now is what to do for our "scheduled" mini break. L-kun and grandparents would be flying back to Sapporo on the 12th, and T-chan and I had been planning on swanning around Nikko. The earthquake-tsunami-nuclear disaster put paid to those plans; as it did to so many other peoples plans (and lives). Instead we've decided to get out of Tokyo for the 3 days - and will be either travelling to Nagoya; or back to Kyoto. Let's just say it's not easy deciding these things when both of us are busy (my work load's gone through the roof in expectation of going away on leave... funny how that is... and T-chan's busy preparing for the wedding). I know - how can we be thinking of holidaying in Japan now? Well, I have to say that I love travelling around Japan, and whilst the country is in a state of shock (and possibly concussion) from the events of the 11th of March, life must go on. I know people are not in a ebullient mood now, but I guess we prefer to view Japan through the lens of what it hasn't lost (as compared to what it has lost). I also know that there's going to be some disruption, though things seem to be normalising now somewhat (power black outs have stopped for the moment, but are due to come back next week... what impact will that have on us? I don't know yet). Hard to make decision... and let's just say my poor old Lonely Planet guide from way back in 2002 is getting a dusting off (yes, I still read books). Anyhow, I'm sure they're both two very good experiences (though I hesitate to say great experiences, all things considered). Because it's Cherry Blossom season now, not only can accommodation be difficult (though I bet a lot of foreign tourists will be absent this year), but also the roads can be murder at this time of year. We'd previously experienced aborted attempts to see Cherry Blossoms in Hokkaido due to 25 km long traffic jams... and the online guide for Hikone warns about heavy traffic at this time of year. Actually - I have to admit that I'm a little worried about the access to petrol these days in Honshu. I would be happy to hear people's views (if anyone has an opinion on having been to the places of Option 1 in particular - or indeed, if anyone reads this).